The Philadelphia 76ers and Boston Celtics have been rivals almost as long as there's been a league for them to be rivals in, and while that rivalry has ebbed and flowed over the decades, with both squads coming to the end of respective rebuilds, it looks to be heating back up again. 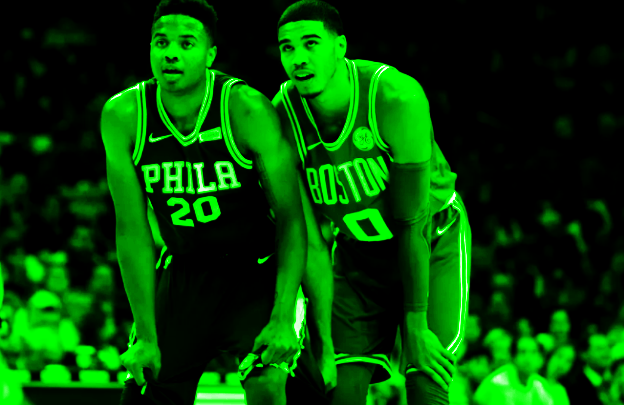 To that end, the folks over at Sports Talk Philadelphia's podcast, the Pick Swap, teamed up with CelticsLife's Justin Quinn to take a look at each other's rebuilds in context, where the teams are at now, and where they might go from here. They also dive into the game this Thursday and the match in London this January. Jesse Larch, Brandon Apter, Joshua Liddick and Justin get into Marcus Smart's value to the Celtics, what he might command in free agency, and all kinds of juicy tidbits about each other's teams. There's loads of information about the 76ers, and lots of thoughts on how Boston looks to non-fans, so block off some time and listen to this week's mid-week podcast - we promise you won't walk away without learning something new about our longtime rivals...and maybe even the Celtics, too.